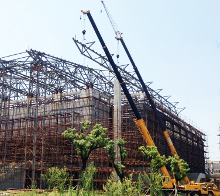 XCMG cranes have been used across a range of wind turbine erection jobs in China this summer. An XGC16000 1000t crawler crane was used at Zhangjiakou Wind Farm in Hebei Province to install heavy 5MW wind turbine components. One of firm’s QUY400 crawler cranes worked on the construction of China Power Investment Corporation’s Xinjiang Kumul 10m watt wind farm project. The crane was set up with a 72m main boom with a 12m extended jib, which the manufacturer said could lift up to 79t. Five XCMG cranes were used in the construction of a wind farm in Guangdong. Amongst these XCMG cranes was an XCMG QAY1200 used to lift and install 21 2.0MW wind turbines. An XCMG QUY500W crawler crane was also used in the Xinjiang wind turbine project. The Chinese company described the QUY500W crawler crane as a dedicated wind power crane with a capacity of 105t and lifting height of over 90m. To meet short-distance transport needs XCMG said that the QUY500W is equipped with optional telescopic caterpillar tracks.